Growing up in Manila, I tend to be a hot-meal kind of person. A meal wasn’t a complete one if I didn’t have anything warm. So imagine the awkward feeling I had when I first came to Europe, and my French housemates would serve couscous salad and charcuterie. I felt like they were consciously starving me so I’d quit and leave. (Well, not really, that was the pang of hunger turning into a soap-opera drama queen.) Seriously though, it took a while before I got used to the idea of cold salads as a main dish. I think I got brainwashed though coz everytime I visit Manila now, I feel guilty for eating all the rich dishes and not eating enough veggies and salads. Oh, the joys of identity crisis. I have always loved vegetables though since I was a kid. Among me and my brothers, I was the only fan of my parents’ vegetable side dishes. So me falling for salads was not far-flung idea. On these (yes, I will say it again) stinging cold winter days, salads slide back to the non-appetizing/satisfying meal compartment of my brain. To compensate for the guilt that comes with this, I turn to stir-fry dishes, particularly Chopsuey. 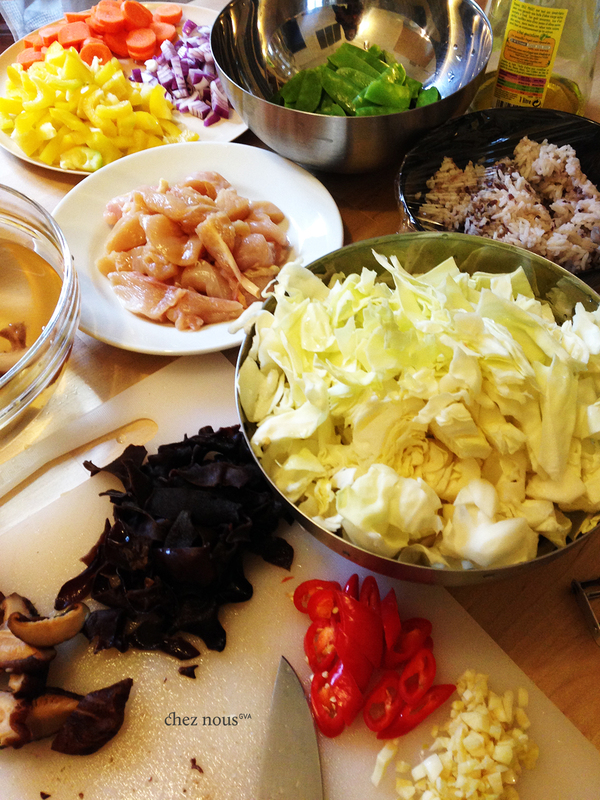 Chopsuey, a Chinese dish, is one of those basic recipes that you have to know if you’re learning Asian cuisine. It has many different variations, and this one here is my interpretation of my mom’s version. Look at the colours of that beauty. And the taste is very easy. It’s one of those dishes you don’t mind serving to foreign/Western friends because it’s not spicy or too bizarre yet it is very tasty. It’s versatile too as you can serve it with rice or with noodles. Or even alone! Heat the oil in a wok. Keep it in high heat. Sauté the onions, and add the garlic once the onions are transluscent. Add in the chicken when the garlic’s a bit brownish. Stir a bit to cook the chicken. This step, as my mom would explain, enhances the flavor of the chicken and makes the meat absorb the garlic-onion goodness. Now, add the fish sauce and stir. 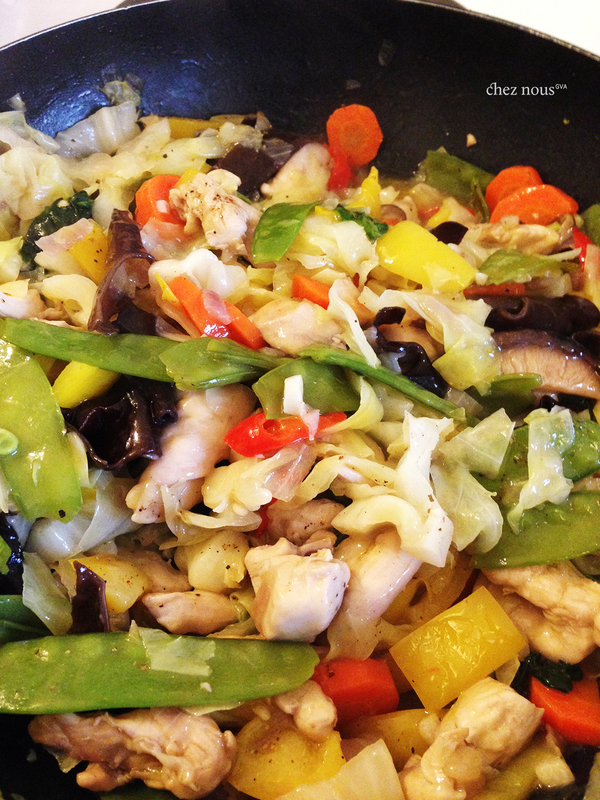 This will make your kitchen smell very fishy, but this is going to make your Chopsuey really tasty! Stir, stir, stir, add the oyster sauce, stir, stir, stir. You can start adding in the vegetables starting with the hard ones like the carrots. If you want them to remain crispy, quickly add the rest of the veggies. Add the water, cover the wok and let simmer for 5-10 minutes. Usually, the cabbage will water down your stir fry as it cooks and wilts. You can then add the cornstarch mixture to thicken the sauce. Once it’s consistency is good for you, turn off the heat, crack some pepper over it, and drizzle some sesame oil.